All citizens of the Republic of Tajikistan who have their residence in Switzerland are kindly requested to complete the registration at the Consular Section of the Embassy. According to the article 29 of the Law of Tajikistan “On Citizenship of the Republic of Tajikistan”, the persons residing abroad without having a consular registration within five years, unless there is a valid excuse, can lose their rights to citizenship. On 20th February 2015, Tajikistan acceded to the Apostille Convention and became the 108th member of the Hague Convention abolishing the requirement of legalisation for foreign public documents, concluded October 5, 1961. The Apostille Convention has entered into force on 31st October 2015 for Tajikistan. Therefore, all types of official documents , certified and sealed by a Notary Public, when affixed or attached with an Apostille Certificate issued by the Swiss Government, will automatically be accepted for legal use in foreign countries signatories to the Hague Convention, i.e. Tajikistan. We inform all foreign citizens that a new electronic system of visa processing and issuance for foreign nationals and stateless persons has been introduced in diplomatic missions and consular offices of the Republic of Tajikistan on 1 January 2017. Now foreign nationals and stateless persons need to submit the necessary documents to obtain a Tajik visa in the diplomatic missions and consulates of the Republic of Tajikistan at www.visa.gov.tj. Depending on the results of pre-assessment, consular officers may invite applicants via e-mail for necessary processing procedures. It should be outlined that a Tajik visa to be issued in the country’s airports upon arrival will also be processed via the website of www.visa.gov.tj. As a result of pre-assessment, the system sends visa confirmation to applicants, which needs to be printed before departure and presented in consular offices at airports as a supporting document to obtain a Tajik visa. From January 1st, 2017 the Embassy implements a new electronic system of visa processing and issuance for foreign nationals and stateless persons. 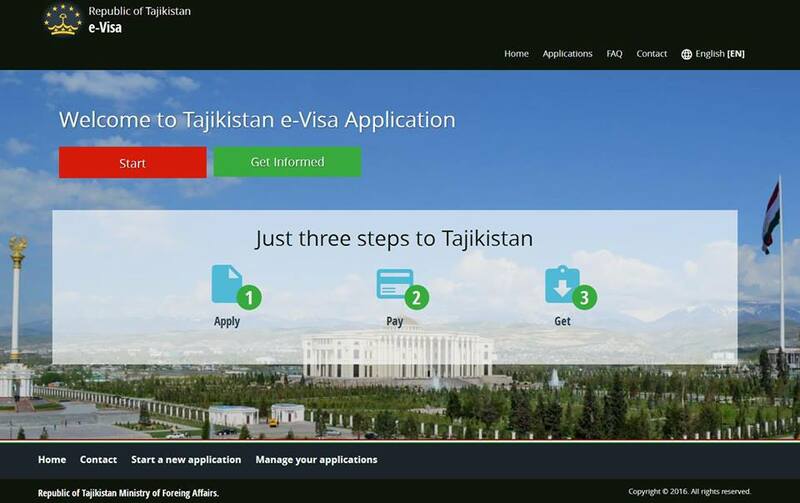 According to the new system, it is required to submit an application form and the supporting documents online via Tajikistan Visa Electronic Application Centre ( www.visa.gov.tj ). Then depending on the results of pre-assessment, an applicant will be invited by e-mail to visit the Embassy for further processing procedures such as digital fingerprints collection, taking a digital photograph, etc. There are some applicants whose fingerprints are not required. PLEASE BE SURE THAT YOU HAVE AN AGREED APPOINTMENT WITH THE CONSULAR SECTION OF THE EMBASSY. WE RECOMMEND YOU TO MAKE AN APPOINTMENT 3-4 WORKING DAYS BEFORE THE DATE YOU ARE ABLE TO COME TO THE EMBASSY. PLEASE NOTE THAT THE APPLICANTS WITHOUT AN AGREED APPOINTMENT WILL BE NOT ACCEPTED. The cost for GBAO permit is 20 EURO. Visa processing time at the Embassy is 3-5 BUSINESS DAYS. While applying for tourist visa, we suggest the applicant to choose 45 days as for duration stay. With a view to preventing misunderstanding, we would like to inform that the new electronic system for Tajik visa processing is not associated with the Tajik e-Visa System. The Tajik e-Visa is processed at www.evisa.tj. It is a single entry visa issued for the period of 90 days, but its holder can stay in Tajikistan not more than 45 days starting from the arrival date. e-Visa is not subject to extension except force-majeure situations. On 1st June 2016 the new portal for issuance of electronic visas “e-Visa”, (https://www.evisa.tj) which enables foreign citizens willing to enter the country with tourist or business visas to complete the electronic application and receive the electronic visa without visiting consulate representatives of Tajikistan abroad, commences its operation. Please note that the e-Visa application has no connection with Tajik Embassies or Consulates General. For any questions or comments, kindly contact the e-Visa Support Desk by clicking on Main Page > Contact Us. But, given the fact that over the past few days there have been many appeals to this matter, the Embassy gives the following explanation. Important! Be sure to look whether or not a payment has been made, only then proceed with the payment, so one would avoid a double payment! For those, who have made a payment, will be issued a visa after the consideration of their appeal. You should be able to start a new application without any difficulty after following these steps.